The massive gaming show that is E3 2017 will be here before we know it, and today Microsoft dropped some big news about its plans for the show. The Xbox One maker will host its always-highly anticipated press conference (coyly called a "briefing") on Sunday, June 11 at 2pm PT/5pm ET/10pm BST. Typically, Microsoft's presser is on the Monday of E3 week, so the date is a change of course for the company. What's more, it doesn't look like watching endless footage of Xbox games is the event's main attraction. Microsoft's flier is back dropped against an image of a chip that's been used to talk up Project Scorpio, it's ultra-powerful next-gen console. 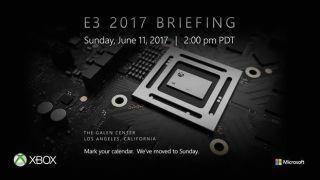 The image seems to be a clear sign the briefing will put a major emphasis on the device, which was first announced at last year's E3. The tech giant claims Project Scorpio will have the most powerful graphics processor ever put into a gaming console when it launches during holiday 2017, along with boasting native 4K gaming support for the first time. Microsoft will likely use its E3 event to go beyond the hype and give us details on what exactly Scorpio can do, plus show off games intended to take advantage of its souped up internals. We may even get a look at the console, too. With Project Scorpio the star of its E3, Microsoft may put less of a focus on games in general this year. For starters, the company has closed down several of its own studios and cancelled a number of titles - including Lionhead Studios, the makers of the Fable franchise, and Platinum Games' Scalebound. Not only that, but game developers may be drawn to the PS4's more robust sales numbers, giving them pause before signing up to be an Xbox-exclusive. While games will no doubt be a part of Microsoft's E3 experience (Forza! Halo! Gears of War! ), Xbox head Phil Spencer and squad may put a bigger spotlight on hardware than they have at past shows. TechRadar will be on the ground at E3 to bring you everything Microsoft announces, so stay tuned for all the latest. Oh, and if you want to get a ticket to this year's show, now you can.